The original business was founded in July 15, 1920. The original business was founded by Langdon S. Barron, Sr. and Ben A. Richter on July 15, 1920, as the Barron & Richter Pattern Company operating at 730 South Broadway in St. Louis, Missouri. In 1923, Langdon Barron acquired sole ownership of the company and in 1925 moved the location to 907 Howard Street. It was at this location that operations expanded in 1937 to include machine finishing of bronze and aluminum castings. In order to fill the need for quality production castings to support the metal-finishing operations, Mr. Barron entered into partnership with Charles Elmendorf in January of 1941 under the name of Alpha Brass Foundry Company. In 1944, Mr. Barron again became sole owner of the company. The pattern division became inactive in 1954 with emphasis of operations being devoted to production of bronze and aluminum castings. In April, 1958, ownership was transferred to his widow, Clara A. Barron and management assumed by his son, Robert H. Barron. Mr. Barron joined the company in 1938 as a pattern apprentice. His career was interrupted several times for active military service as a pilot in the U.S. Army Air Force. Construction of a new plant was completed in November of 1958 at 97 Ford Lane in Hazelwood, Missouri. The business incorporated on August 1, l960, with Robert H. Barron as president and general manager. Mr. Barron patented the Alpha Process of shell face coremaking and has made it possible for the business to provide quality castings at competitive prices. In 1972, Mr. Barron's son, Emerson S. Barron, joined the company learning all aspects of the foundry business. After ten years of teaching and training his son, Robert H. Barron retired. Since acquiring the business in 1982, Emerson Barron has changed the direction of the foundry from a predominantly green sand, brass and bronze facility to an aluminum, Alpha Process foundry. He had positioned the company for the future by incorporating computer technology in its earliest years to both the design and production of castings. 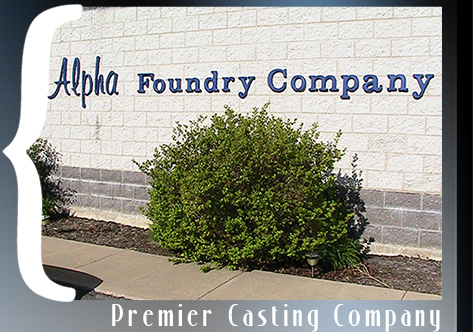 In November of 1993, the corporate name was changed to Alpha Foundry Company, having ceased production of brass alloy castings. Then 1996, the foundry returned to its roots and expanded to include a machine shop. With the purchase of state-of-the-art CNC machines, Alpha is capable of machining our castings and producing our own molding patterns with great accuracy. Having purchased another machine shop in January 2002, Alpha has further expanded its capabilities to include CNC lathe machining and a full range of machining services. 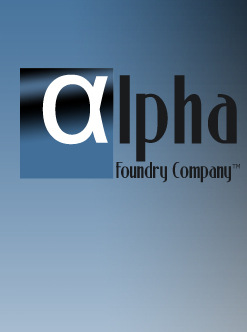 In May of 1999, a fourth-generation Barron entered into full-time employment at Alpha Foundry. Ryan Barron, having worked part-time at Alpha for many years, graduated from Washington University in spring of 1999 with a B.S. Degree in Mechanical Engineering. Having earned his MBA in 2006, Ryan now functions as President and General Manager overseeing all business operations of the company.